The Standard Adapter with Medium Brown Pro Strap from Camdapter provides a strong and functional hand strap system that can be used with a camera, neck strap and tripod - all at the same time. The Adapter is manufactured from rugged black anodized aluminum and is recommended for cameras with a rubber base around the tripod thread. Once attached, the plate stays put and won't slip around like various camera flash brackets that skew and that you always find yourself readjusting. The Adapter plate screws into your tripod socket and has a 1/4-20 tripod thread on the bottom so you'll always be able to attach your camera to a tripod without removing the strap - a real benefit when the shot calls for added stability or a slow shutter speed. The Adapter also has double strap lugs that permits you to use the Pro Strap as well as a neck strap. This assures a double layer of protection against any possible slippage. One of the main features of the Adapter is that at no time will it block access to either the battery or media card compartments - another time saver during a shoot. The Adapter is extremely lightweight at 2.0 oz (56.7 g) even with all its pins and screws. 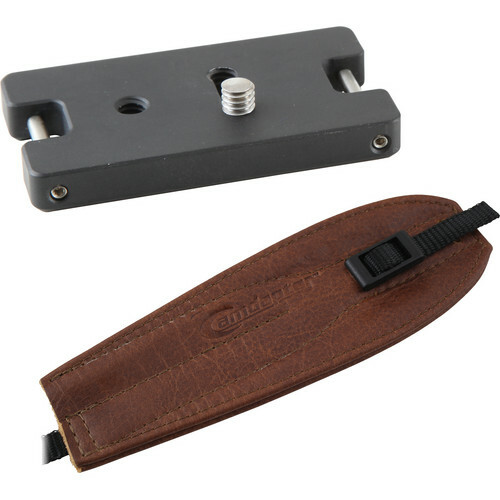 The Pro Strap is made from top grain leather and is soft and comfortable. It fits into your camera easily and stays in place once you've easily adjusted it to your hand. It's bolstered by heavy-duty nylon thread and is made from one continuous piece of rugged 3/8" nylon webbing. For added safety, it has a built-in slip lock. The Camdapter comes with a two-year warranty against manufacturer's defects and may be the answer to the age old problem of a strap system that has the flexibility to hold your camera and neck strap while leaving you the ability to attach your tripod to the system. Box Dimensions (LxWxH) 10.9 x 2.0 x 0.5"
Standard Adapter with Medium Brown Pro Strap is rated 5.0 out of 5 by 1. Rated 5 out of 5 by Nofrickenidea from Great Basic Strap Was looking for a hand strap to use with my D700 (Especially when loaded up with heavy glass). I'm not a big fan of neck straps so this seemed the way to go. It was this strap or the Nikon version. The Nikon version did seem to lock down more secure from the look of it, but I like the idea of a little more flexibility vs the security. Once adjusted to my hand I find the Camdater strap offers a good amount of support. The adaptor plate (as well as strap) seems very well made. Nice to have the option of additional mounting points for shoulder strap also. As usual B&H had excellent service and product selection. Will be back for more gear as the need arises. Is the camdapter standard adapter compatible with the Nikon D-7200? Yes, this product is compatible with the Nikon D7200. Will this work with the sony a7r ii mirrorless?? Yes, this would be compatible with the A7R II.